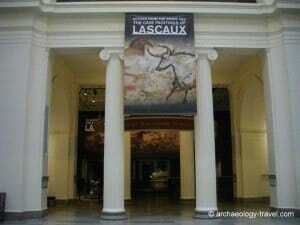 For various reasons I missed the Lascaux III exhibition when it opened at the CAP Sciences in Bordeaux last year. 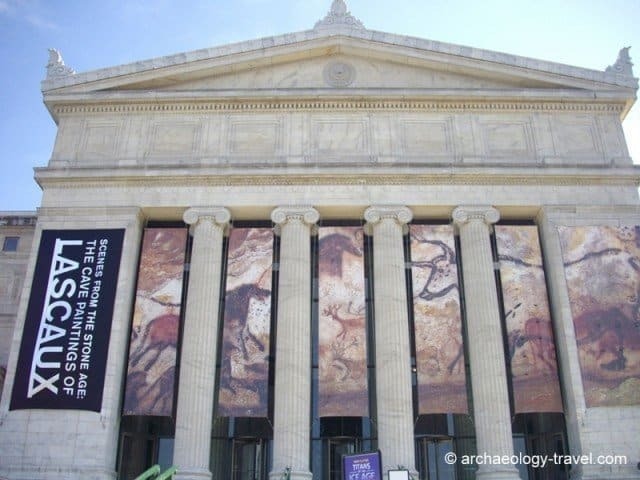 So I was delighted when I realised I would be visiting Chicago while “Scenes from the Stone Age: the Cave Paintings of Lascaux” was on show at the Field Museum. And, as I had heard mixed reports about the Bordeaux show, I was eager to see it. The Cave of Lascaux with its Stone Age art is one of the World’s most iconic archaeological sites. After all, it was the discovery of these spectacular paintings in 1940 that lead to a radical re-thinking about popular perceptions of the ‘origins of art’. Not surprisingly then thousands of people went to see the cave. All this sudden interest after thousands of years of near perfect isolation had a negative impact on the preservation paintings, something the French authorities are still battling with. One of the solutions was to restrict access to Lascaux and create a replica. Now Lascaux II, an excellent reproduction of part of the cave, also receives thousands of visitors each year. Recently a new series of replicas of previously unreproduced parts of the cave were created, and it is these that form the basis of this new exhibition about Lascaux, which is in the process of touring various museums around the World, ahead of the construction of Lascaux IV – a new, state of the art interpretation centre in the Dordogne. Entrance to the exhibit in the Field Museum. Entering the exhibit, the first object you see is a fine-lined engraving of a horse on a small rock from the Dordogne (now in the Logan Museum of Anthropology, Beloit, Wisconsin). An obvious and good choice for getting the exhibition off to a good start, this clearly visible outline of a horse gives visitors an excellent idea of the stunning beauty of Palaeolithic art. A skeleton of a woman, and the reconstruction of her face, then introduces the people who made the cave art of the Dordogne. The skeleton, from the Field Museum’s collection, is dated to the same archaeological period the imagery in Lascaux is dated to. Whether this ordering of the different sections was predetermined by the exhibition space or not, I do not know. But the layout of the different sections was confusing, and does not allow people to engage with the exhibition. I was saddened to observe how people just seemed to wonder through, glancing left and right, here and there. Unfortunately, however, there is no sense of development to the exhibition, it does not move towards something spectacular. I did over-hear one lady say to another, “Is that it?” as they exited the final gallery and went into the souvenir shop. I have to admit, that was my reaction as well. But believe me, there is something spectacular in this exhibition. You just have to watch out for it. The sections dealing with the history of the cave’s discovery, the dating of the art within the cave, the reproduction of the replica and the interpretation of the images are traditional and uninspired displays. And even worse, they were broken up by the more exciting elements. Hence the confusion. By far the more interesting and engaging aspects of the exhibition are the various models of the cave. There are 1:10 scale models, fibre glass ‘tubes’ that replicate those parts of the cave with the most well known panels of paintings and engravings. As I have been fortunate enough to get entry into Lascaux, these models really do give a good idea about the physical space inside the cave. A map relates these portions one to another. There is also a digital 3D reconstruction of the entire cave that brings the cave alive. It is not interactive, but it does start with the physical space, and develops to the art and ends with what the cave might have looked like in the past. I would love to describe this presentation in more detail, but I do not want to spoil it – it is fantastic! And then there are the live-size replicas of selected painted panels, set in a darkened portion of the exhibition to give the impression of walking through a cave. These really are spectacular, the images in Lascaux are simply beautiful and while the examples on display are not the more famous examples, it is good to see what else Lascaux has to offer. The ordering of the models within the exhibition could have been used to create a more interesting show. With the more informative, albeit very traditional displays, at the beginning, the models could then have been used to create a sense of informed adventure, ending with the life-size replicas. Moving from the scale models to the 3D reconstruction, then ending with the wonders of the art, well the best we can have it outside the cave itself, would have provided a more interesting flow and given the exhibition a sense of climax rather than bemusement. So I am torn. Yes, I was disappointed. Given the hype this exhibition has had (and I have helped with that hype here on this blog), and with the banners on the front of the Field Museum, I have to admit I was excited when I finally climbed those steps to the entrance of the museum. But sadly the exhibition did not live up to expectations, also it is quite expensive for what it actually is. The problem for me is not the subject matter, after all I have spent many years researching cave art. Rather, it is the traditional nature of much of the exhibit that surprised me. But then on reflection, even with what is there it was the lack of imagination in the arrangement of the sections within exhibition that baffled me. Go and see it, the 3D reconstruction is amazing! The exhibition ‘Scenes from the Stone Age: The Cave Paintings of Lascaux’ is on at the Field Museum in Chicago until 8 September 2013. For further details, and information on future venues, click here. 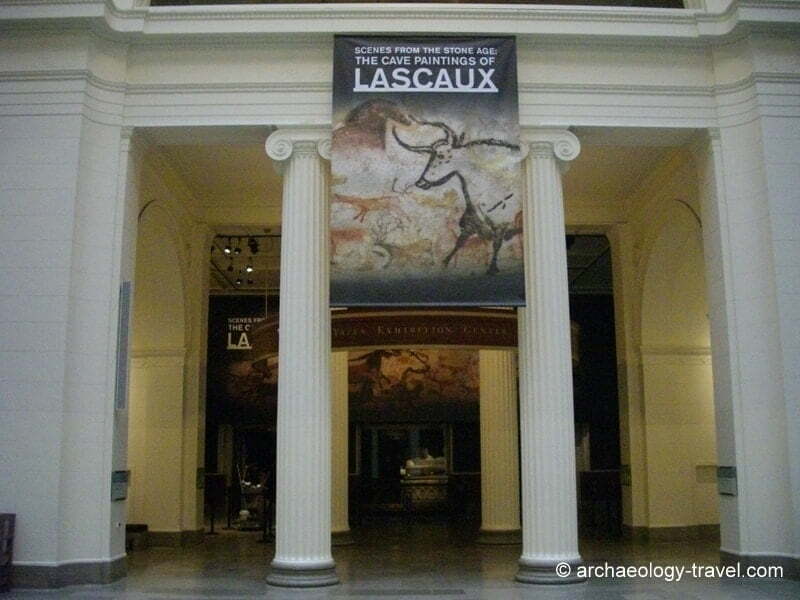 For information about visiting Lascaux II, click here. Larger than life, Lascaux on the façade of the Field Museum. We visited The Lascaux exhibition at Cinqantenaire Museum in Brussels and would echo many of your sentiments Thomas. Our first disappointment on entering the exhibition was that none of the information was in English. Perhaps this was rather arrogant of us but we had assumed that there would perhaps be an audio or a printed guide in a choice of languages. The exhibition was laid out in a way that made it difficult to follow chronologically and this was frustrating particularly as we were having to translate the information too. Some attempts had been made to include interactive elements for younger visitors but these were not particularly engaging. The exhibition offered a new and faithful section of the cave that has never been seen before in the form of 5 life size movable replicas of the Nave and the Shaft. Although these were fascinating to see we felt more could have been done to create a “cave like” experience rather than something very sterile and modern with tiled floors and overly bright lights. Exiting this area, we came across a film with English subtitles (hooray!) that gave a lot of really good information on how the paintings were executed and what made them so unique. This was worth watching and helped make some sense of the exhibition.